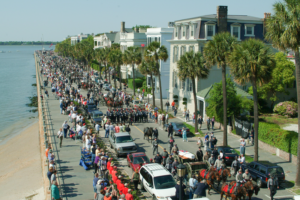 All eyes were focused on this Southern port city to watch the Hunley – the world’s first successful combat submarine – finally return home from a voyage that began well over a century ago. The harbor was filled with on-lookers. Well-wishers and reporters from around the world lined the docks, watching history unfold. The interior of the Hunley was opened for the first time in 137 years. 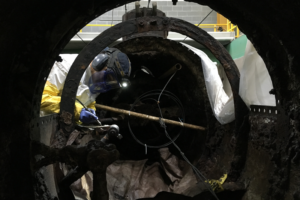 When the plates were removed the submarine kept its structural integrity, meaning the vessel was sturdy enough for a more thorough archaeological exploration. 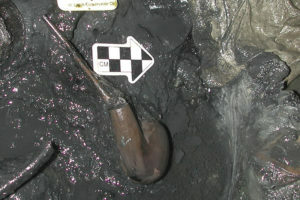 Archaeologists working down through the sediment first identify the crank used by the crew to propel the submarine. The wooden bench the crew sat upon was uncovered along with two artillery buttons, possibly from a military coat. 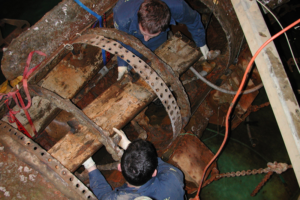 As archaeologists worked down to the bottom of the vessel, the seven handles of the crank were exposed, revealing where the crew sat and propelled the submarine. Some additional personal items belonging to the crew emerged, including a shoe, more buttons, a pencil, and a pipe. The wooden pipe still had tobacco in the bowl. 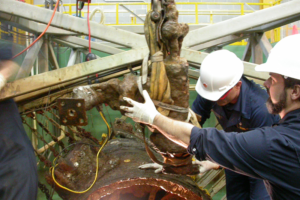 The team found the first male cranium and would ultimately locate the full remains of eight crewmembers that perished on the submarine. 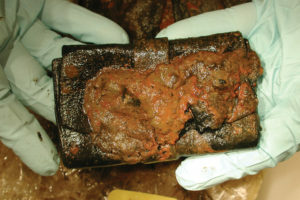 An item believed to be a leather wallet was retrieved. Though the wallet’s contents were no longer intact, each personal artifact found helps tell the story of the men who served on the Hunley. 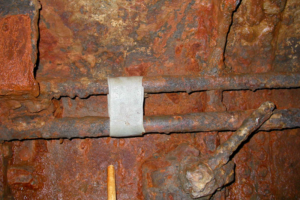 An unexpected find in a secret Confederate submarine: a dog tag from a Union soldier. The tag belonged to Ezra Chamberlin of Connecticut. 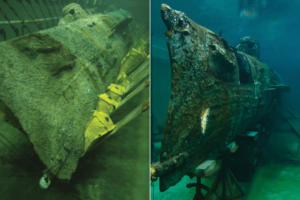 The discovery led many to speculate there may have been a spy onboard the Hunley. 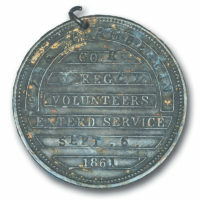 Further research showed Ezra was not aboard, but his ID tag was being worn by Hunley crewmember Joseph Ridgaway, which he likely picked up as a battlefield souvenir. 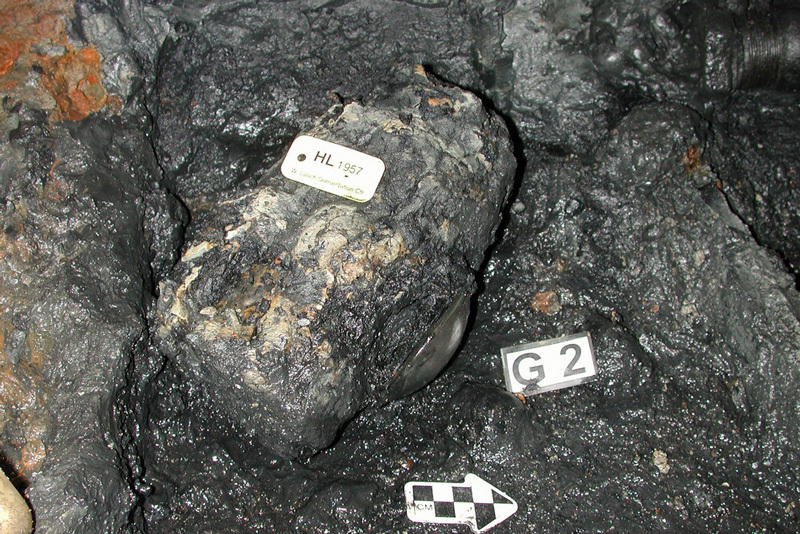 A lantern is found near Hunley Captain Lt. George Dixon’s remains. Though it has been speculated the lantern may have been used to signal to Confederates on shore, its main purpose was likely to help light the crew compartment. 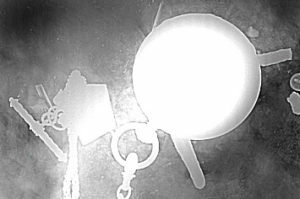 X-rays of the block of sediment containing Lt. Dixon’s remains revealed a pocket watch and metal clasp. Binoculars were also found near the captain’s seat. This phase included a focused study of the human remains and the excavation of block lifts. 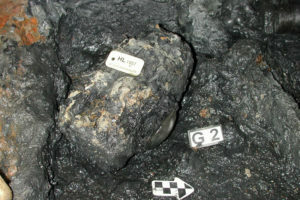 The study of the human remains has helped lead to the identification of some crewmembers. The excavation of the submarine’s ballast tanks. 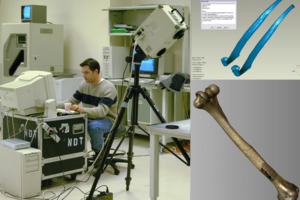 3D scanning of the skeletal remains of the crew begins. Remains of the crew laid to rest at Magnolia Cemetery. 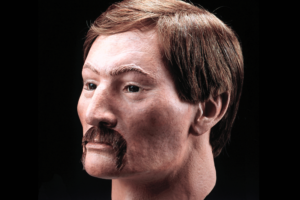 DNA match positively identified Hunley Crewmember as Joseph Ridgaway of Talbot County, Maryland. 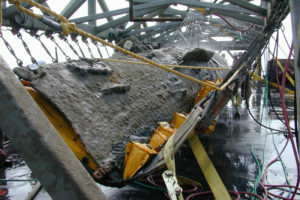 The crew bench was removed from the submarine for a conservation treatment. 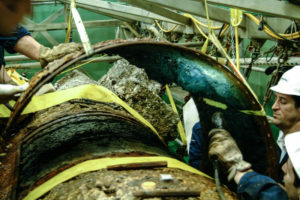 The pipe connecting the ballast tanks connecting was removed in sections. 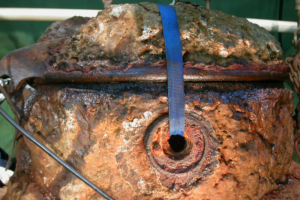 The aft hatch cover was removed for conservation and served as a “test run” on how to treat the submarine. 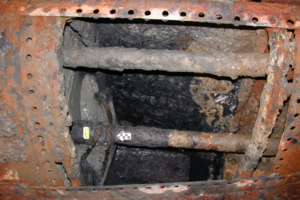 The aft pump was removed for conservation. 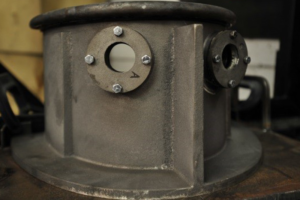 The forward pump was removed for conservation. The pump settings may help ascertain what steps, if any, the crew were taking to save their lives. 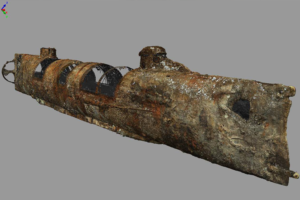 3D scanning of the exterior surface of the Hunley begins. Ballistic testing on a replica of the forward conning tower. 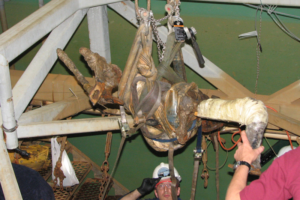 The Hunley was carefully rotated to an upright position after resting on her side for over a century. 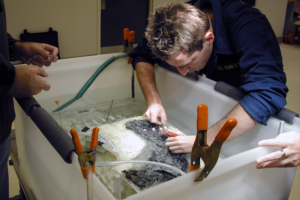 The Hunley is submerged for the first time in a bath of sodium hydroxide designed to conserve the iron structure. This process is expected to last 5 – 7 years. 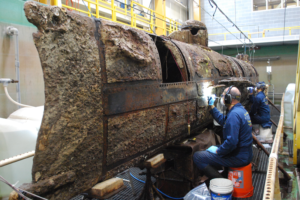 The Hunley was encased in a layer of sand, sediment, rust and silt called concretion that built up overtime while she was lost at sea. 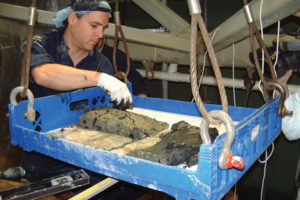 The team delicately removed this material and exposed the original surface of the Hunley. 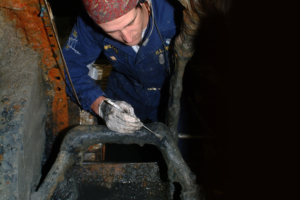 Once conservators removed the concretion covering the outside, they started working inside the crew compartment. 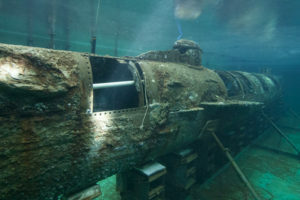 Finally being able to see the actual surface of the submarine is helping scientists study how the submarine operated and why she was lost in 1864.